You don't need a special occasion to enjoy the best Blueberry Mango Margarita you've ever had! 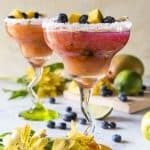 Muddled blueberries, lime, tequila, and simple syrup come together with an orange-mango puree in a deliciously colorful cocktail you can (and should!) drink all year long. Coat rim of margarita glasses with juice from a lime wedge, then dip rim into margarita salt. Set aside. Combine blueberries, simple syrup, triple sec, and lime juice in a cocktail shaker and muddle together until blueberries are juiced. Close the shaker and shake ingredients briefly, then divide into margarita glasses. Discard blueberry skins. Combine mango puree, tequila, and orange juice in the shaker with a few ice cubes. Shake well, then divide into the glasses.